Rhonda Abrams' guidelines (referenced yesterday here) offer a tactical checklist, but the process of learning about markets requires a broader perspective and strategic overview. A couple examples from recent reading follow. In a recent McKinsey Quarterly newsletter article entititled "Is your Emerging Market Strategy Local Enough?" the authors ( reference "granular insights and capabilities." This is a great term and key concept. It is too easy for overmeetinged and jet lagged executives sitting in meetings in teh US (while their voice mail and email pile up) to view global markets as homogenous. The point is this: not only is Latin America comprised of different markets (different characteristics and potential) but South America is further and even, as the article points out Brazil itself is comprised of many distinct markets. The authors write "Of course, most leading corporations have learned to address different markets in Europe and the United States. But in the emerging world, there is a compelling case for learning the ropes much faster than most companies feel comfortable doing." Do you have the right people in house and on the ground locally to learn the ropes quickly enough? 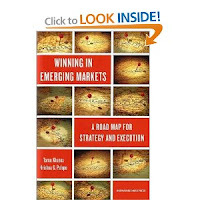 In his book Winning in Emerging Markets: A Roadmap for Strategy and Execution, HBS professor Tarun Khanna provides a framework which is helpful to analyize and evaluation potential markets, partners and competitors. Designed for large multinationals, the framework is nevertheless a great tool to help even small companies rationalize their market focus and develop a strategic overview which in many cases should include the deliberate exclusion of certain markets during certain phases of their globalization effort.